Replacement Cebora CP 50 torch head suitable for various plasma cutters, a replacement head for the CP 50 / Trafimet CB 50 torch which is widely used across various Chinese and other plasma cutters. 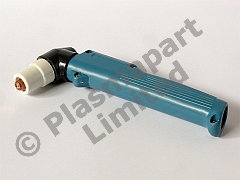 This pack includes the torch head fitted with dust-proofed trigger switch and a set of consumables fitted as shown. This torch is rated for cutting up to 50 amps.